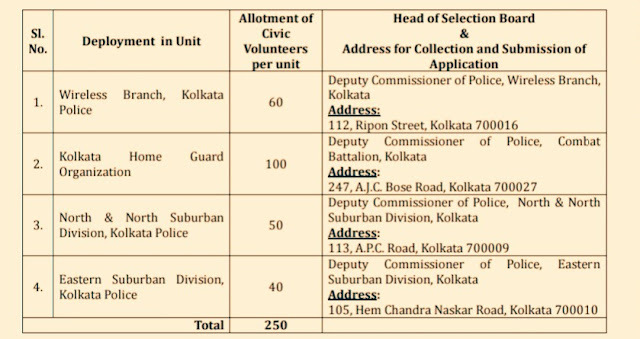 Kolkata Police, West Bengal, Has Published A Recruitment Notification For The Post Of Civic Volunteer Under Different Unitsr, So Eligible Male/Female Candidates Can Apply For This Job & Offline Application Form Should Reach In Concern Address In Given Time. Kindly Read Out The Official Notification For Accurate Information, It's Given Below. A. Number Of Vacancies & Name Of The Posts (EMPLOYMENT NOTICE NO. FRC/Recruit/01/2019). Kolkata Home Guard Organization - 100 Vacancies. Wireless Branch, Kolkata Police→ 60 Vacancies. North & North Suburban Division, Kolkata Police→50 Vacancies. Eastern Suburban Division, Kolkata Police →40 Vacancies. 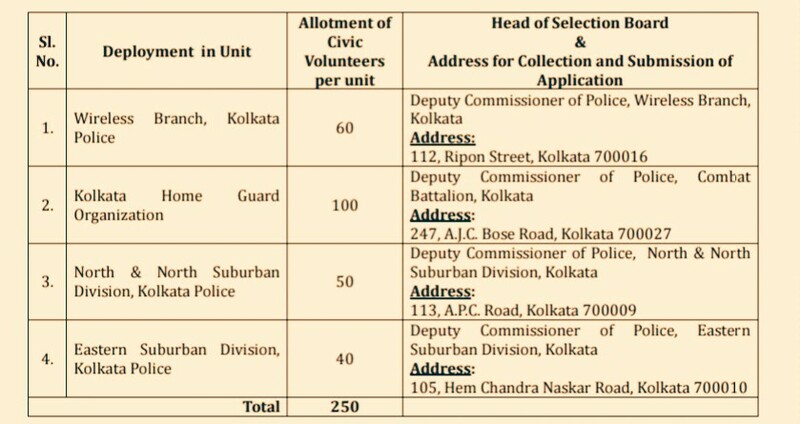 Total Number Of Vacancies →250 Kolkata Civic Volunteer 2019. B. Eligible Criteria For Civic Volunteer Recruitment 2019 Application Form. Age Limit →20 Years To 60 Years, As On 1St Of January, 2019. Educational Qualifications →Minimum Qualifications Requirements Is 8 Pass. Last Date For Offline Application Form Submission →23rd Of January, 2019 - Candidates Are Requested To Submit Their Application Form In Prescribed Format With Important Documents, Address Is Given Above In The Image. For More Information>The Official Website Of Kolkata Police. Now Apply For WB Civic Volunteer Recruitment 2019. Thank You And Do Visit Here For More Jobs In West Bengal And All Other Government Jobs News Alerts, Till Then Stay Safe And Blessed.